Emmy: A UK firm started by Emmy Scarterfield, the brand creates beautifully designed handmade shoes and accessories. You can follow Emmy on Twitter, visit the company’s Facebook page or read the blog they recently launched. Below we show Kate carrying the ‘Natasha’ clutch in Emmy’s ‘chocolate brown’ and ‘carbon’ colors, done in an elegant suede. A classic British company that continues to grow in popularity, Mulberry was founded in 1971 and still manufactures bags in the UK. 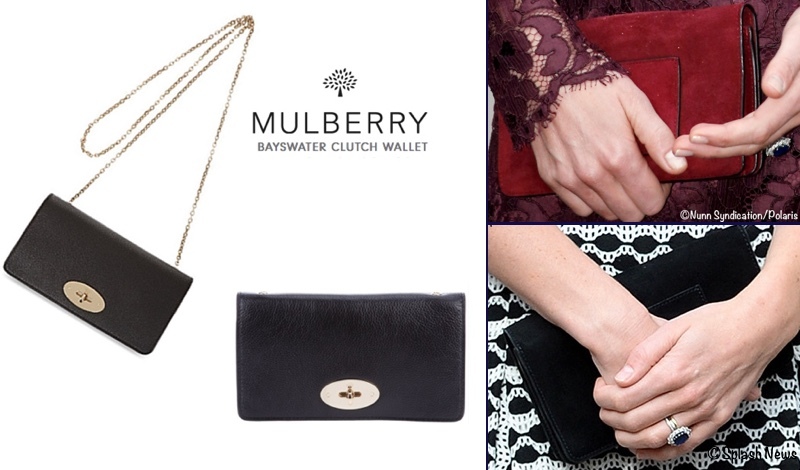 The Mulberry Facebook page is here, Instagram page is here and Twitter feed is here. 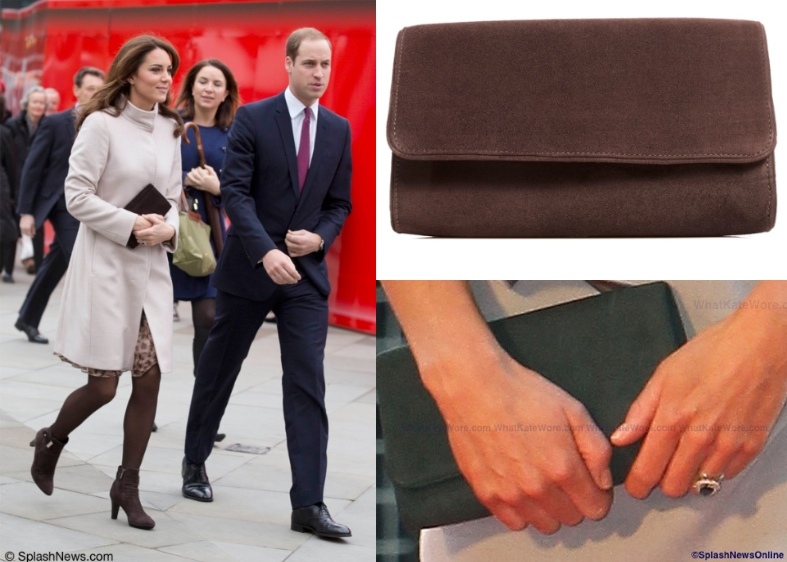 More than any other item from this brand, Kate carries the Bayswater Clutch Wallet in multiple colors, including black suede, conker (cranberry) suede and buttercream suede. 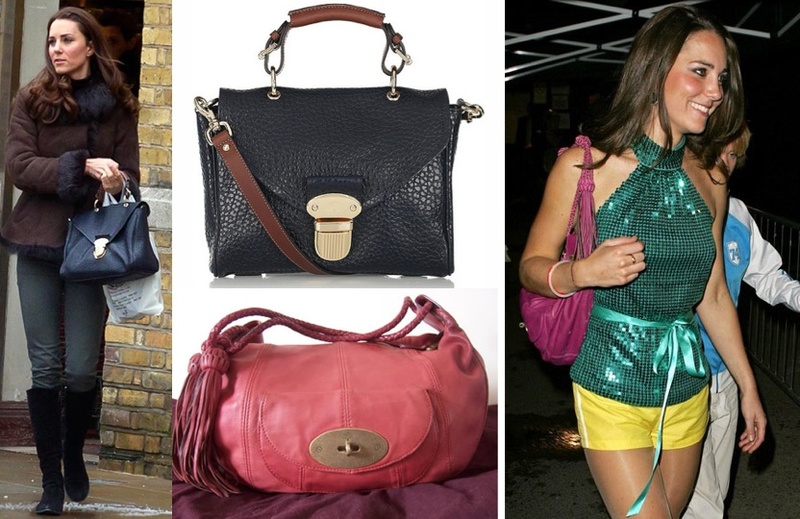 Additionally, Kate has carried Mulberry’s ‘Polly Push Lock‘, as well as the Araline in Fuchsia, both are seen below. Tod’s: The Italian leather goods company is one the Duchess has favored for some time, she carries the company’s handbags and also wears Tod’s shoes. To visit Tod’s Facebook page, click here. One of her favorites is the D-Bag, a style actually named after the late Princess Diana, she was very fond of Tod’s and carried an earlier version of this now-iconic bag. Kate has been seen with different colors, including both grey and the tobacco. There are multiple versions of the bag, including the Luxury style, it comes with platinum plated hardware and runs $4850 USD+, the standard model starts at $1665 USD. 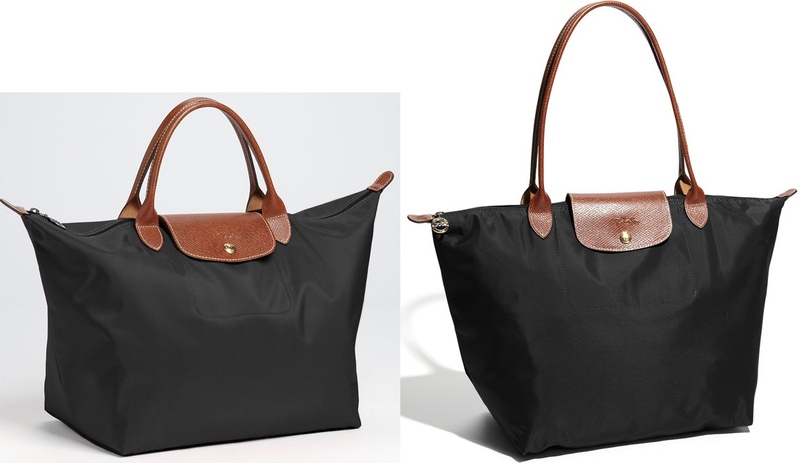 Longchamp Le Pliage Totes: Long a favorite of the town and country set, Kate is very fond of her Le Pliage bags. They are roomy, very durable and come in two styles: longer handles for carrying the bag on one’s shoulder; and the shorter handle carried as a tote. The Duchess has them in both sizes and several colors. Kate’s assistant., Rebecca English, has been seen carrying one of the bags, and the family’s Nanny, Maria Borrallo, has carried one on outings with George. Below left we show the short-handled style in the Medium size and the longer handle version in Large. ANYA HINDMARCH: Another British label, the company is known for luxury accessories offered in more than 50 stores worldwide, along with a bespoke service. The company’s website is here, its Facebook page here, and Twitter feed here. Kate has carried many bags by Anya Hindmarch, including the Marano (l) and Bespoke Maud (r) throughout 2011 and 2012. A better look at those pieces. Kate has also carried the Fan Clutch. LK BENNETT: The British company remains a favorite of the Duchess, she is frequently seen in the brand’s apparel and footwear, she also carries LK Bennet bags. The LK Bennett UK/International website is here, its US & Canadian website is here, the Facebook page is here. One of Kate’s most frequently carried bags is the label’s “Natalie”. 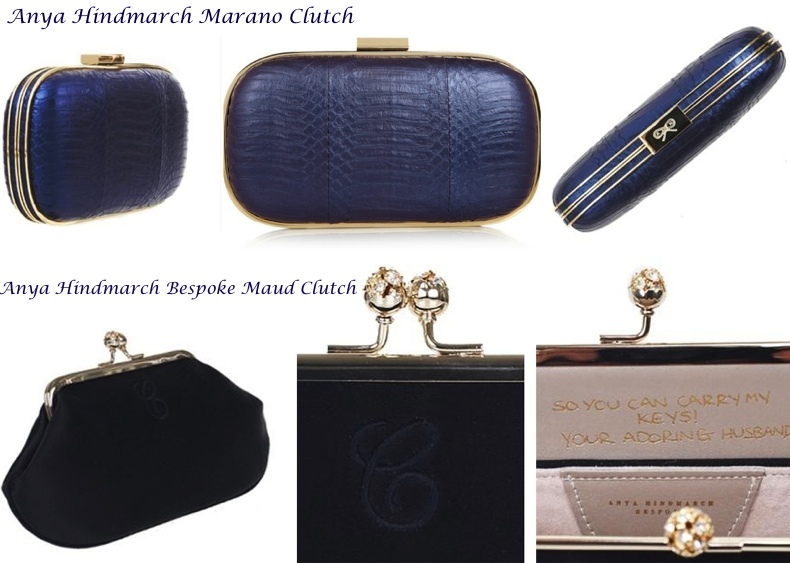 We show her carrying the label’s ‘Natalie’ clutch on the North American Tour in 2011, at a Buckingham Palace party and Order of the Garter ceremonies, the two latter events in 2012. The Natalie is a highly versatile piece, constructed of interwoven strips of leather, it measures about 6″ x 4″. 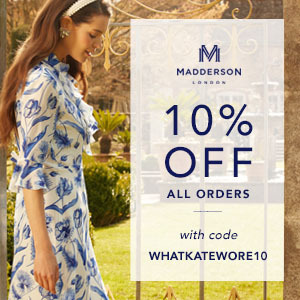 LK Bennett still offers the bag on their UK website. 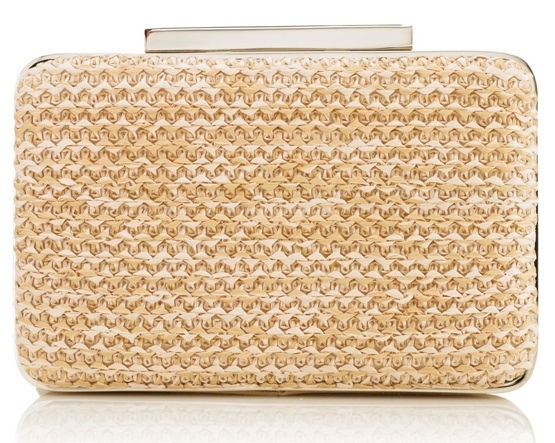 The Duchess started carrying the Avona Long Roll Clutch in light taupe patent leather. The bag is from the spring 2013 collection, it sold for $295/£195.